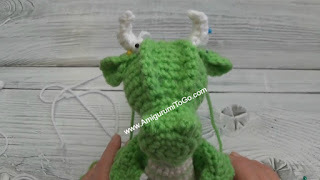 This is part six of the Small But Mighty Dragon crochet-along. In this part we will be making the head and all the parts for the head. We will also assemble the head and sew it to the body. I wanted to give you different options for decorating the head. You can make spikes or horns or both. I couldn’t decide what I wanted for the blue dragon and ended up changing my mind a few times. In the end he ended up with the shortest horns. The pink dragon has the longest ones and the green dragon in the photo above did not get any. There are 8 videos for this part of the CAL. Video links are given in the pattern below. 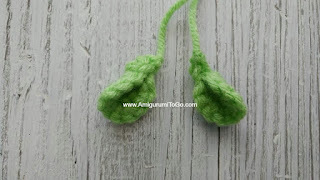 also shows how to finish row 2 for both the ears and mouth. fold ear, wrong side together, then sc through both sides to hold the fold. f/o leaving a tail for sewing. Eyelids: begin each one with a starting yarn tail long enough to sew into the head. 2) 1sc in the 2nd ch, 1hdc in the next 3ch, 1sc in the next, then sl st the last ch. There are 2 different lengths for the spikes. You can make as many as you would like. You could mix them up and make long and short spikes. You could also add spikes and horns together. Or choose to not make any. This video shows how many spikes you can fit on the head. It also shows how to crochet the shorter spike and how to sew it closed. Flip the spike over so the starting yarn tail is on the opposite side furthest from you, cut it up shorter than the spike. Lay the starting yarn tail inside and fold the spike in half so the edges touch. Whip stitch the outer loops together, knot off at the end and leave the yarn tail for sewing. 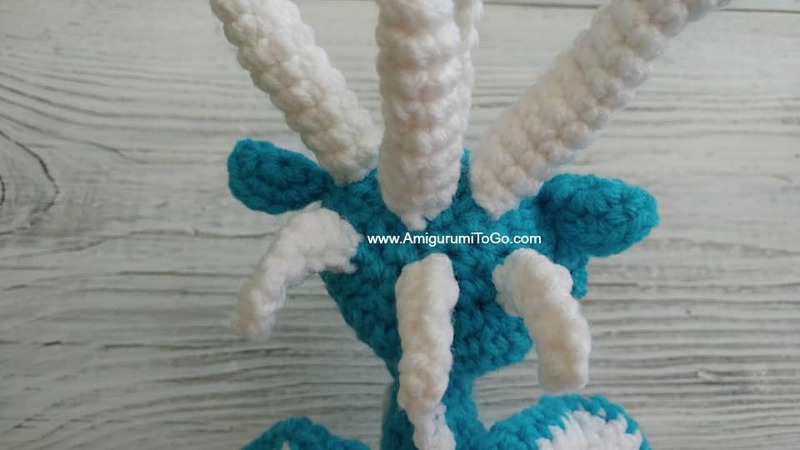 You can crochet 3 different lengths for the horns. Anarya, the pink dragon, has the longer horns. 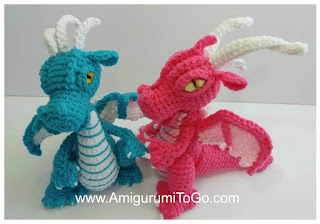 Ari, the blue dragon has the shortest horns. This video shows how to crochet in a small round and how to insert the wire into the horn. switch to a smaller hook (3mm-3.5mm) for a thinner horn. Also, if you plan on using a wire like I did, begin row 1 with a long starting yarn tail. You will use it for sewing the wire in. 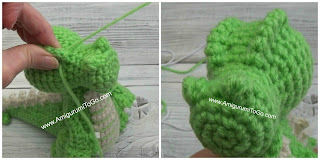 Using your hook, pull the starting yarn tail though the center hole of row 1 and leave it hanging. This video shows how to do rows 5, 6, 10 and 19 of the head. I also show how to stuff and shape as we go along. We start with the front of the face so make sure the center gap of row 1 is closed tight. *Note: The sl st behind the bobbles created 2 extra stitches, we will skip over those in the next round. f/o leaving a tail for sewing. Weave in and out of the remaining stitches then stuff more into the head. Make sure to shape as you stuff. Once done, pull yarn tail tight to close up the head, knot off and hide yarn tail inside head. The videos and written instructions for the assembly of the head are in the order it should be done. 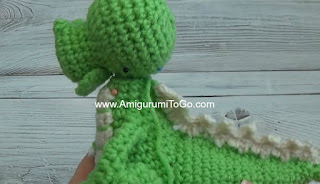 1-2) This video shows how to add a tongue to the mouth, how to sew the mouth to the head and how to sew the head onto the dragon. 3-4) This video shows how to add ridges to the top and back of the head and where to sew the ears. 5-6) This video shows how to add the eyes, how to crochet the eyelids and how to sew them together. 7) This video shows how to sew in the spikes and horns. 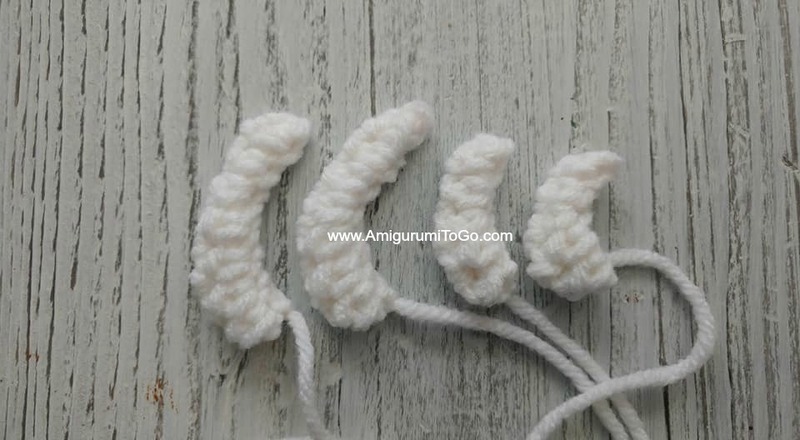 1) Decide if you want a felt tongue or crochet one. I chose a piece of felt since it isn't so bulky. I show how a crochet one would look in the video. You can sew the felt in with sewing thread and a regular sewing needle or use a dab of hot glue in the center of the wrong side of the mouth. Once the tongue is in place, sew the mouth to rows 8 and 9, leaving the front of the mouth open. I found it easier to sew the head to the body before finishing the rest of the head assembly. That way the body holds the head up for you while you work on it. Make sure the neck is fully stuffed right up to the top. 2) Place the 10th to 13th row of the head onto the neck. Pin it in place then sew it in. I sewed around 2 times. 3) If you want ridges on the head, pinch the area you want raised then sew with a strand of yarn to hold that pinched part in place. Ridges are optional. You could put the 2 ridges a bit further apart than I did for this one. Keep in mind you will be adding eyes so leave room for those. 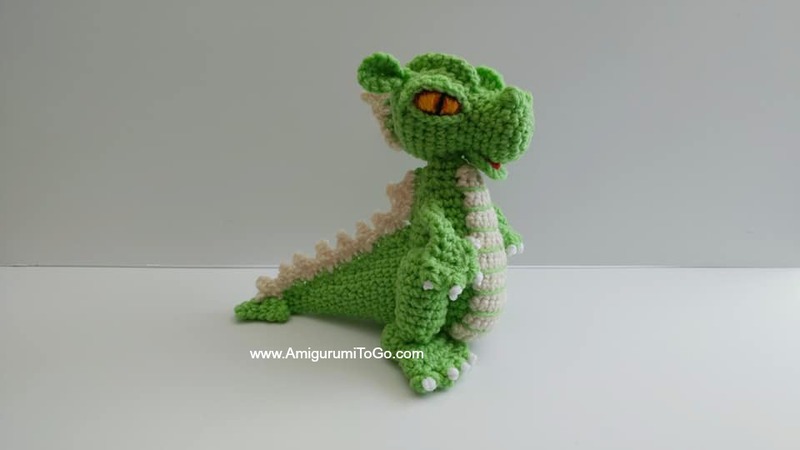 If you want taller ridges you could crochet on top of them using a variety of different stitches. You could also add a ridge on the back of the head. In the video I show how to crochet on top of the ridges and how to give them different looks. 4) Add the eyes by pulling yarn through in between rows 10 and 11 then wrap the yarn in one direction, ending in between rows 13 and 14 then turn around and wrap over it again, this adds some bulk to the eye. I didn't give them any special shape as the eyelids will shape them. Add a strand of black yarn for the pupil. Optional: Use a regular brown felt pen to outline the eye, this gives a shadow effect. You could also use different colors, like red or orange, to color the eye. I show all of this in the video. 5) Sew the bottom eyelid in first. There should be 3 holding stitches, one in each corner and one in the center. Don't pull the center stitch too tight, just snug enough to hold it in place. Sew the top one in. There should be 4 holding stitches, one for each corner and 2 at the top to keep the top lid in place. I started on the right corner first, the needle can go right in the center of the corner. The other corner can be lower, that will add more shape to the eye. I show this in the video. 6) Sew the ears on or about row 15. Again, play around with different ideas. Maybe you want horns just above the ears. I used 2 short spikes as horns, pictured below. 7) Sew the spikes and horns in. Play around with this part. You don't have to add any or you can add many. Pin them in first, sew any center ones first. I haven't decided yet what to do with the blue dragon. The top photo below shows him with spikes and horns together, the photo below that shows him with 3 longer spikes. One thing to keep in mind is there will be wings added so you don't want anything on the bottom row of the head to be too long. I show how to sew 2 colors together in the video. I changed Ari's spikes to the shortest horns after this photo was taken. Congratulations to us all! We are now finished part 6 of the schedule. You can post your photos on facebook in the comments of this post. see you soon for part 7!